Unlike AAA, Anthropologie carries its own products that will likely be well-received as Mother's day gifts. Like AAA, they have chosen to send a cross-brand email partnering with a retailer that showcases flowers, in this case, with Terrain, a sister brand within the Urban Outfitters family. Apple, 5/1 -- All the gifts that will make Mom's day. Apple pretty much sets the benchmark for email creative. In my experience, every designer aspires to create like Apple, and every client (wether they are retail, B2B or other) cites Apple as an example of what they want their email campaigns to resemble. 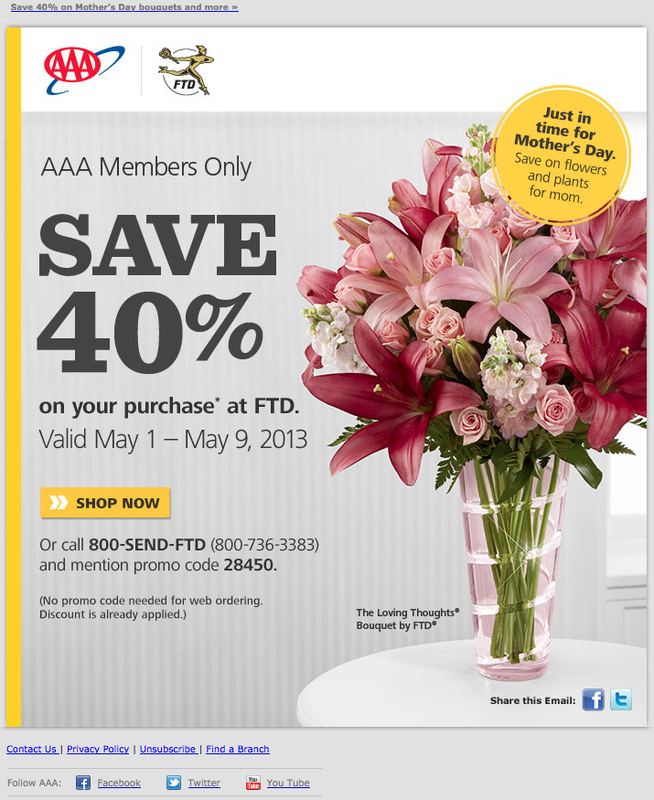 1-800-FLOWERS.COM, 5/2 -- SAVE 40% on Our Best Selling Rose & Lily Bouquet for Mom! Hayneedle.com, 5/2 -- Introducing Gift Registries: WIN a $10,000 Dream Registry Giveaway! ... Dream. Shop. Celebrate. Walmart, 5/2 -- Wanna be Mom’s favorite? 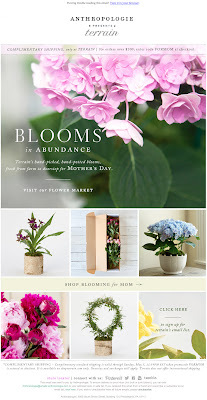 Great Mother’s Day Gifts for less. ModCloth.com, 5/1 -- These just in! Zipcar, 5/2 -- Who could resist a surprise? Not us. And Mom can't either. Snapfish, 5/1 -- FREE 2-day shipping + 20% off gifts for Mom | Print Sale! Crate and Barrel, 5/1 -- 9 gifts Mom is sure to love. Bed Bath & Beyond, 4/30 -- Act Now! Your 20% offer is waiting. Make her breakfast. Make her day.